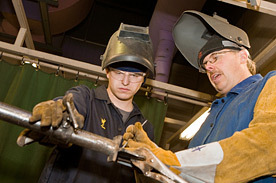 The Registered Apprenticeship Program (RAP) is an apprenticeship program for high school students. Traditionally, apprenticeships in Alberta began after students graduated from high school, however, some students identify their career interests at an earlier age and are ready to learn and practice their future trade while still in high school. RAP is an ideal program for these students. RAP students are both full-time students and registered apprentices, dividing their time between an approved work site and their high school studies. They take regular courses such as English Language Arts, Social Studies, Science and Math in order to earn their Alberta High School Diploma or Certificate of Achievement. The time a RAP student spends at school and on the work site can be quite flexible. The student, school and employer jointly agree on a suitable schedule. The student might work as a RAP apprentice for a semester, for half of each school day, or for one or two days per week, or during summers, holidays and weekends. The RAP apprenticeship ends when the RAP apprentice finishes high school. The RAP apprentice is then automatically registered as a regular apprentice and the credit earned while in the RAP program is applied to his or her apprenticeship through the apprenticeship program. Contact Allan.Stewart@ecsd.net the RAP coordinator at Holy Trinity High School, visit an Apprenticeship and Industry Training office or call the toll-free information line at 1-800-248-4823 for more information. Get yourself started!